Some of you may have noticed that we have been blessed with the opportunity to do a little fund-raising via Sseko Sandals. With every purchase 10% goes into our adoption fund. The remaining portion (90%) helps women in Uganda get an education and make a sustainable income. I happen to have a pair of Ssekos and can’t say enough about my love for them! 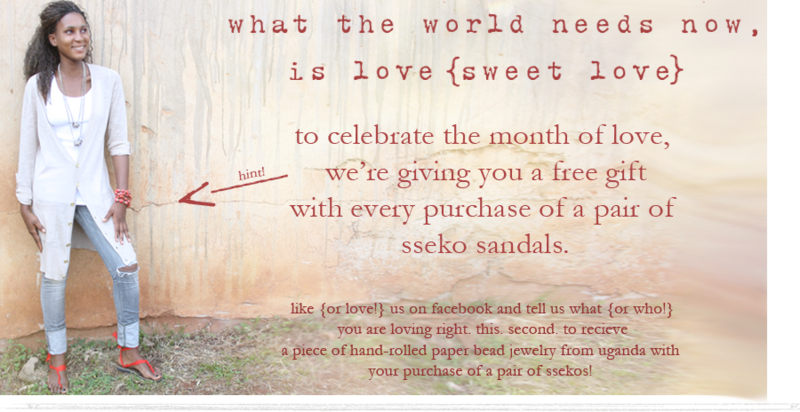 To get to the point, Sseko is celebrating the month of February by giving a FREE hand rolled paper bead necklace with every order. These are typically around $25! So if you have been considering a Sseko purchase now is the time! Remember to type “aroadhome” in the “where did you hear about us” box.